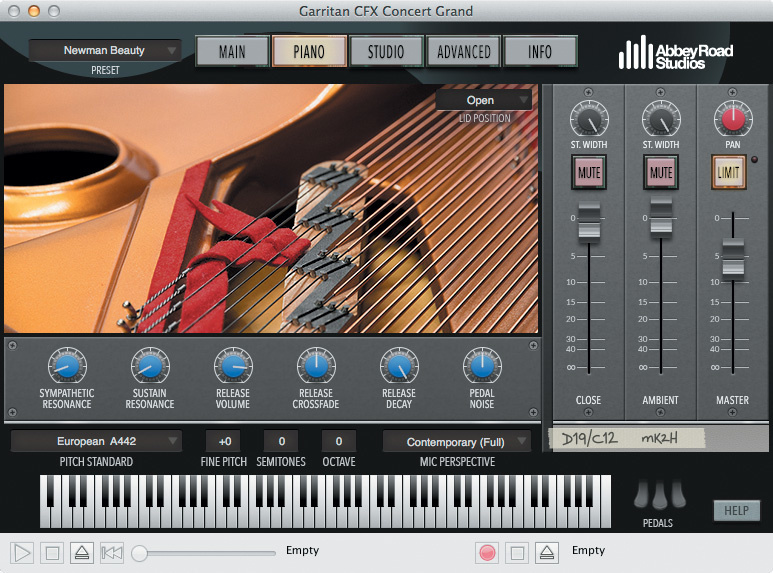 Garritan’s latest library raises the bar for virtual piano instruments. 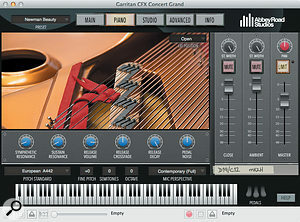 CFX Concert Grand is the first dedicated piano instrument that Garritan have released since being bought by MakeMusic Inc, the developers of the notation app Finale, at the end of 2011. There had previously been the Authorized Steinway Virtual Concert Grand Piano, but that’s now discontinued, and what’s on test here is an entirely new product. It’s tough for virtual pianos to stand out in what is a very crowded marketplace, especially when mature products like Synthogy’s Ivory have become almost industry standards. So with CFX Concert Grand (which I’m going to henceforth call ‘CFX’) Garritan have taken a multi-pronged approach. 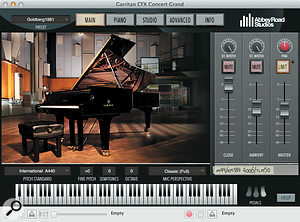 With almost identical appearance when running as a plug-in or stand-alone app, CFX Concert Grand’s interface is based around five main pages, with the keyboard, pitch parameters and mixer common to all of them.Firstly, they’ve gone for originality: the single piano that’s been sampled, a nine-foot Yamaha CFX grand, has rarely (if ever) been sampled before. Secondly, there’s an endorsement: Abbey Road Studio One was used for the sessions. Thirdly, there’s flexibility in the form of multiple audio ‘perspectives’, derived from some tasty mic arrays. Close and ambient feeds can be mixed together and EQ’d in various combinations, with a convolution reverb on hand for even more options. Oh, and CFX Concert Grand is big! A mere 16GB installer package spawns a whopping 132GB of samples after decompression, offering every note of the piano sampled full-length at many dynamic levels. It all looks good on paper, but can CFX Concert Grand really deliver as a musical instrument? For an instrument that is supposedly fairly standardised, it’s remarkable how much real pianos vary from one to another. Steinways are totally different propositions to Bechsteins, as are Bosendorfers to Faziolis, and the cultural and historical baggage that go along with these great names feed our preconceptions about the musical roles for which they’re best suited. Yamahas are too often thought of primarily as pop pianos, with a strident and slightly thuggish tone. Certainly the fact that their uprights (not to mention motorbikes!) are everywhere does nothing to position Yamaha as a luxury, premium marque. However, that perception is way too simplistic, and the CFX is an entirely different proposition. It’s hand built, the nine-foot model costs upwards of £100,000$100,000, and plenty of classical virtuosi have been ready to endorse it. There’s one in the Sydney Opera House, no less. And yet it’s also being chosen by jazz musicians, at prestigious festivals and venues including Ronnie Scott’s in London. Classic: The close channel here is a mix of Neumann M49 and KM184 pairs, while the ambient sound is a blend of DPA 4006 omni mics placed at each end of the piano and a pair of Neumann TLM50s. You’d hope that mics of that value would produce a great sound, and thankfully they do, with what is quite frankly a stunning piano capture. There’s clarity, weight and immediacy across a wide dynamic range. Contemporary: A slightly fuller, more focused and ballsy sound. It combines an interesting AKG C12 & D19 close pickup with Schoeps MK2H room mics. As to whether ‘contemporary’ is a code word for ‘pop/rock’, well, possibly. Subjectively the player may feel there’s more to immediately ‘dig into’ here. It’s not a world away from Classic, though, just another flavour. Player: The goal here was to recreate the experience of sitting at the piano keyboard, and to that end the close channel has Neumann KM84s over the hammers, and the ambient a Neumann KU100 dummy head over the player’s head. Again, it doesn’t change the piano’s essential character, but my first impressions were that this was the cleanest and most neutral perspective. In headphones I did not, incidentally, experience any spine-tingling ultra-realistic binaural magic from the dummy head channel heard alone. In fact I found some contribution from the close mics was always necessary, to provide focus and prevent the high treble sounding too distant. Garritan then offers all of these perspectives in three alternative versions, varying in the number of samples they use, and hence the demand on your computer resources. ‘Full’ is the no-holds barred multi-sampled monster. Every note sampled full length, apparently at 20 dynamic levels, and including an entire soft pedal una corda sample set. ‘Compact’ uses approximately a fifth the number of samples, fewer dynamic levels, and just soft pedal emulation. ‘Notation’ is smaller still, only loading the close mic array for each of the perspectives. It’s not a bad option to have available, and may well be a nod towards Finale users, who at the time of writing are still working within the constraints of a 32-bit application, and the limited memory addressing which goes along with that. 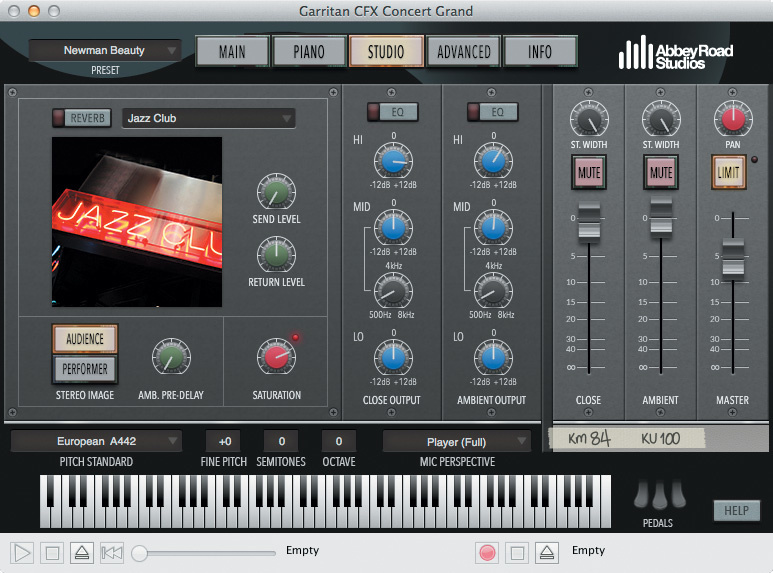 CFX’s perspective selection and the accompanying virtual mixer channels are at the core of its sound palette and both are a fixture in the user interface. A row of tuning and transposition controls are also available in all five interface ‘pages’. Those work as you’d expect, by the way, and the octave shift parameter of ± three octaves does not extend the pitch range beyond that of the real piano. Switching to the Piano page lifts the lid on CFX’s sound-shaping options. Sympathetic Resonance controls the amount by which the sounding of one note excites any others that are currently undamped and have shared harmonic content. When this is turned up, a C chord held silently in the upper part of the piano will begin to ring when you whack a bass C below. And that’s just a blatant manifestation of it; sympathetic interplay happens across the pitch range, coming and going between all held notes, contributing subtly but significantly to the sense of realism. A few classical pieces even exploit the effect specifically. The Piano page’s controls add acoustic resonances, pedal noises and room sound for each of the three multi-mic perspectives.Working along similar lines, Sustain Resonance controls the level of sympathetic ringing when the sustain (or ‘damper’) pedal is depressed. This is potentially a much more obvious effect, creating a luxurious ‘halo’ around played notes, as when the dampers are raised all strings can vibrate freely. The three Release controls relate to CFX’s use of separate note release samples that are triggered by MIDI note-off messages. Garritan might as well have grouped them together under an ‘Abbey Road Studio One Contribution’ banner, as they control the amount of room tone that’s audible after notes are damped. Far from a subtle effect, when Release Volume and Decay are turned up the big, bright Studio One reverb tail rings on after note endings. It’s an unexpected and fine-sounding feature, and I hasten to stress that it is completely controllable — with the Release knobs turned down the piano sound goes completely dry. Or rather, it almost does. The top octave and a third of the pitch range, which on the original CFX (as with most grand pianos) has no dampers, has the room sound even when it’s been silenced lower down. In real-world playing situations I doubt many people will notice this slight unevenness in the sampling implementation, which only occurs in certain circumstances anyway. But if you go looking for it the transition is unnatural and unexpected. Lurking in the top right of the piano innards photo is a Lid Position pop-up menu. The three settings — Open, Half and Closed — do sound different from one another, with appropriate changes in treble and mid-range character particularly, but perhaps less so than you might think. Finally the Pedal Noise parameter lets you set the level of sounds associated with operating any of the three pedals. Each of them has its own tone: the damper pedal’s is a two-stage press-release ‘clunk-swish’, while the sostenuto and una corda are a good old-fashioned woody thump and a light whoosh, respectively. None takes account of the velocity of your pedal movements, so attempts at stealthy, silent raising of the dampers are doomed to failure. But again that’s a non-issue for real-world playing. The remainder of CFX’s sound-shaping gizmos are gathered together into two further pages: Studio and Advanced. The convolution reverb offers 12 impulse responses, completely preset in their decay times and characteristics. There’s good variety, from natural sounding rooms and halls to the trippy ‘Dark Pad’ and ‘Retro Space’. The sound quality is excellent too, but I might have traded a decay time knob for the separate Send and Return levels. The stereo imager section is somewhat different to what you might expect. It’s not a stereo-width knob, because you get one of those on each of the Close and Ambient mixer channels. Instead the Audience/Performer pair of buttons changes the way the pitch range is mapped to the stereo image. Coarsely put, it determines whether the bass is on the left and treble on the right, or vice versa. There’s also a knob to dial in a pre-delay of up to 100ms on the Ambient channel, which can help with those super-loose almost-chorused Ultravox ‘Vienna’ tones. Supplementing the mic-centric control of the basic sound, the Studio page adds a useful reverb, EQ, Saturation and stereo imaging options.The Saturation knob is to control a more obvious limiter effect than the brick-wall safety limiter in the Master mixer channel. As you turn it up the sound gets steadily louder, and potentially more harmonically rich too, and higher settings can cause some gritty overdrive or clipping. Moving on, the EQ is simple but effective. The same complement of three bands is provided for each of the Close and Ambient channels, with 12dB cut and boost, and a mid frequency that’s sweepable from 500Hz to 8kHz. I’d love to have seen a link facility here, though, so that the same settings could be made simultaneously on both channels when necessary. And then there’s the Advanced page. At first sight it’s uninspiring, and certainly there are utilitarian features here, like buttons to select maximum polyphony and some techy stuff to do with RAM allocation and disk streaming. However, it’s all interesting and useful. The historical tuning section loads Scala-format tuning descriptions. Fifteen are provided, covering the usual baroque favourites as well as party-pieces like just intonation that are mathematically beautiful but lousy for any normal playing. Crucially, though, you are not limited to these 15, and can load up any of the thousands of .SCL files readily available on the Net. Intriguingly too, microtonal Scala files (like the one that I tried that recreated the 43 divisions/octave scale of experimental composer Harry Partch) do weird and wonderful things to CFX’s sound, skewing playback speed of individual samples so they take on weird harmonic characters. Musical conformists need not apply. Finally, the duo of Dynamic Range knob and Velocity Curve section is brilliantly useful. Tweaking either alters the natural relationship between MIDI key velocity and playback level of individual notes, and the graph’s presets and curve handles can help find the best fit with your MIDI controller keyboard, for one thing. There’s creative potential here too, though, and at the very least turning down the Dynamic Range can make for a piano that sits beautifully in a mix. With the level differences between soft and loud notes lessened, and not a traditional compressor in sight, it’s really the most effective dynamic control method imaginable. I might as well just come straight out and say it: CFX Concert Grand is superb. It’s right up there with the best virtual pianos currently available in hardware or software, and some might argue it’s the best. At its heart, of course, is that Yamaha CFX sound, which is alive, warm and communicative. In Garritan’s implementation it seems to be a ‘goldilocks’ piano: not too dark and woody, but not too bright and strident. I never once wished it was more plummy or transparent, or that it sustained longer, had greater presence, or was more projecting. In fact nothing much occurred to me at all (!) and as I played it, in every style I could muster, I soon began to engage much more with the music than the technology, which says a lot. Also, for me, any one of the three mic perspectives had equal potential as a starting point for many happy hours of musical exploration or disciplined practice. The difference between the Full and Compact versions of each perspective can be heard and also felt. The smaller ones, which use fewer velocity layers, were less immediately responsive and inspiring, though are still very fine by some other standards. As to objective performance, CFX does make significant demands on your CPU, but no more so than most other good sample players, and less than many soft synths. It runs on the ARIA engine developed by the French-Canadian company Plogue Art et Technologie, known also for their Bidule modular environment. It’s a well-regarded platform, and proved completely stable and reliable throughout an extensive testing period. The Advanced page offers a host of different tuning possibilities. All my testing was done on a Mac laptop that’s not far short of its fourth birthday, albeit one with a chip that still doesn’t lag too far behind today’s desktop-class processors, and that had samples stored on an internal SSD. Hosting the VST version of CFX in Presonus’s Studio One DAW, with a playable 256 sample buffer, the CPU hit for one instance averaged around 18 percent, and barely touched 30 percent even when the maximum 128 voices were in use. At a very responsive 64 sample buffer there wasn’t much difference, just a few percentage points in it. This compares well to other virtual pianos I had on hand for reference; Ivory II’s performance was broadly similar, and the demands made by Pianoteq 5 and Kontakt 5 (loaded with NI’s The Giant) were only slightly less whenever they generated any notes. 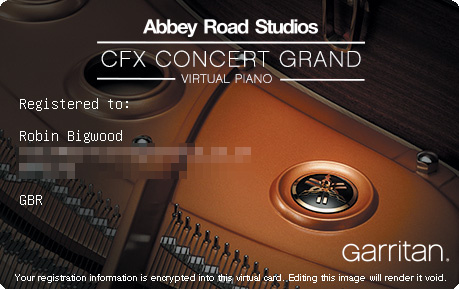 Authorising CFX Concert Grand involves dragging a web-generated image onto the user interface. It’s unusual, but also quick and painless.RAM usage can be extensive. 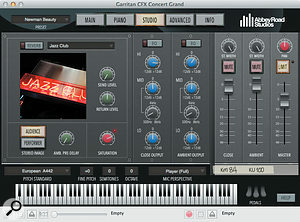 Pop-up menus on CFX’s Advanced page control how much of each note is loaded into RAM (so-called ‘pre-caching’) and the maximum space the sample playback engine can occupy in your physical RAM. Sticking with the default 128K pre-caching setting, Full, Compact and Notation perspectives occupy 1094MB, 559MB and 327MB respectively, and steadily more as you play, up to that Max Allocation value. On my Mac, initial load times from the internal SSD were 22, 8 and 6 seconds. Smaller pre-caching values improve load times and allow you to get away with less RAM, but you’ll pay for it in more disk activity, which eventually a mechanical drive may not be able to keep up with. 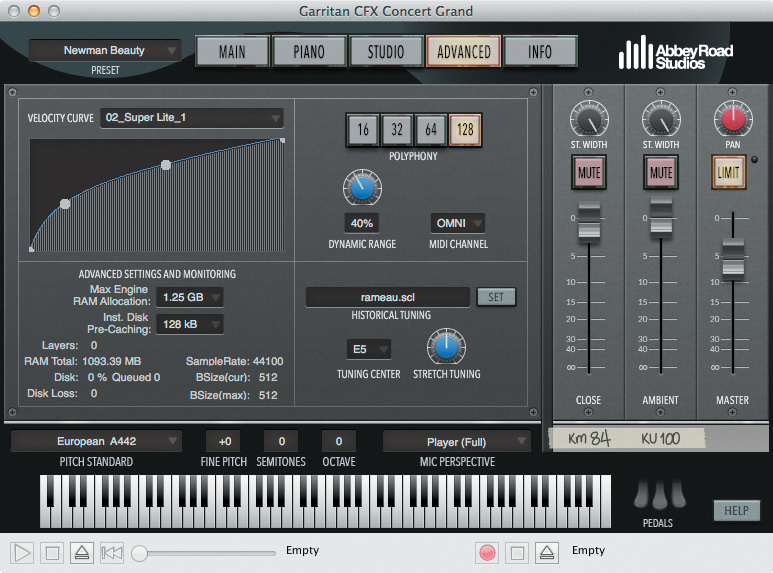 As with most plug-ins, CFX Concert Grand is extensively automatable, depending on the capabilities of your DAW. Most of its main parameters are also pre-mapped to MIDI controller messages, and there’s a full listing in Garritan’s online documentation. Virtual pianos have been really good for a few years now, but with CFX Concert Grand Garritan have raised the bar. It’s probably the best sampled piano there’s ever been. Beautiful to behold, rewarding to play, and with an effortless ability to sound great on most musical styles, what’s not to like? Well, for some the notably shiny and ‘expensive’ quality and obsessive single-piano focus could be a drawback. Some players quite justifiably prize variety and quirkiness, and get a creative kick from pianos (not least upright and vintage models) that are not ‘perfect’ and deliberately have a warts-and-all quality. CFX’s mic choices and editing parameters do allow for a good bit of variation, but it’s fair to say that you will struggle in vain to make the CFX sound old or knackered! Nor will it sound like a Steinway or Bechstein, and even less a baby grand. This sort of multi-piano versatility and creative scope was clearly never part of Garritan’s remit for CFX, though. 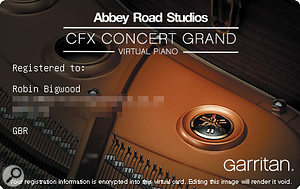 Instead it’s a technically brilliant, unashamedly flawless virtualisation of one of the best pianos ever built. If that appeals to you then this is a safe purchase that’s worth every penny of the asking price. It is a specialist product, no doubt, but like a good real piano offers almost endless creative potential. What more could anyone want? Some offerings at the high end of the virtual piano market have begun to be outclassed in recent years, and not so many now really bear comparison with the likes of CFX, either in the size or completeness of the sampling process, or the playability achieved as a result. One that still very much does is Synthogy’s Ivory II. Its Steinway D in particular sounds similarly classy and contemporary, and feels about as responsive. Their Ivory II Italian Grand Fazioli is worth a look too, as another big, sumptuous, modern piano option. I’m also bound to mention Modartt’s Pianoteq 5. It’s a much better solution for many laptop users, as it’s a modelling rather than sample-based system, and the installation size is tiny. Also, while it’s arguable that its tone can’t quite match CFX’s realism and sheer attractiveness, it equals it in playability and wins out easily in versatility, with access to a large and interesting keyboard and mallet instrument library, and extensive sound design options. Minimum system requirements for CFX are Windows 7 or OS 10.7 running on a multi-core processor with a minimum of 4GB RAM. Later versions of Windows and OS X are supported too, of course, and Garritan recommends 8GB or more of RAM for the best experience. CFX comes in stand-alone, VST, AU, AAX and RTAS versions, and it’s definitely an instrument that can take advantage of a well-specified computer and a 64-bit DAW. The official figure for a full installation is 122GB, though for me it turned out a bit larger, at 132GB. A mere 24.5GB is needed for the Compact (and Notation) versions, but even that could be a deal-breaker for those relying on small, non-replaceable SSDs, such as a MacBook Air’s. If you do go with an external drive you’d be wise to heed the official advice: choose a USB 3.0, Firewire 800 or Thunderbolt model, and preferably with an SSD. A good, fast mechanical drive will also work though. If those hardware requirements seem quite progressive, so might the installation method. CFX comes on a sturdy USB ‘thumb’ drive — no optical disks here! You get to choose the location for the samples during the installation procedure, and then the lengthiest part of the whole business is the decompression stage, which took a good hour on my Mac. Authorisation is also quite novel: registering the product on the Garritan web site generates a ‘keycard’ .PNG file. You then launch the stand-alone version of CFX, drag the keycard graphic on to it, and you’re away. It’s worth quickly mentioning, too, that the packaging and presentation of CFX, as well as Garritan’s printed and online support material, are of a universally high quality. As indeed it should be, for a product of this value, that’s so specialised in nature. One of the nicest pianos you’ll ever hear. Uncannily responsive and addictively playable. Offers interesting mic-based sound variations. Stable and surprisingly CPU efficient. Just the one basic tone. You’ll have to look elsewhere for ‘character’ pianos. Needs a well-specified computer and a solid-state drive for best performance. A musically and technically brilliant virtual Yamaha CFX that saves you approximately £99,800$99,800 over the real thing. 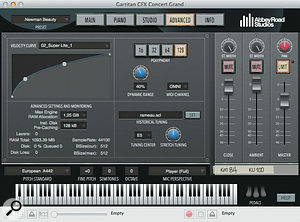 CFX Concert Grand v1.007, VST and stand-alone versions. Apple MacBook Pro 2.2GHz Intel Core i7, 16GB RAM, OS 10.9.4. Samples stored on internal 1TB Crucial M550 SSD. Yamaha CP4 Stage and Roland RD700NX controller keyboards.